Emperor Akihito (明仁天皇, Akihito-tennō, born 23 December 1933) is the reigning emperor of Japan, the 125th emperor of his line according to Japan's traditional order of succession. He is head of the Imperial House of Japan. Akihito became emperor after the death of his father in 1989, who was Emperor Shōwa. The current emperor's official reign name is Heisei (establishing peace). The Japanese government announced in December 2017 that Akihito would abdicate on 30 April 2019.
takes part in affairs of according to the Constitution of Japan. attends various events and ceremonies held at the Imperial Palace. As a personal interest, Akihito studies fish. Akihito directly addressed his subjects in a television broadcast after the 2011 Tōhoku earthquake and tsunami. This was the first time any emperor used television in this way. ↑ Enjoji, Kaori (December 1, 2017). 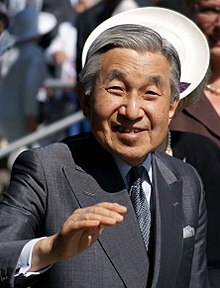 "Japan Emperor Akihito to abdicate on April 30, 2019". CNN. Tokyo. Retrieved December 1, 2017. ↑ Kunaicho, "Ceremonies in Imperial Palace"; retrieved 2011-10-18 (Archived by WebCite). ↑ Kunaicho, "Progress in Tokyo"; retrieved 2011-10-18 (Archived by WebCite). ↑ Kunaicho, "Progress around Japan"; retrieved 2011-10-18 (Archived by WebCite). ↑ Kunaicho, "Visits to Welfare facilities"; retrieved 2011-10-18 (Archived by WebCite). ↑ Kunaicho, "Visits to disaster-affected areas"; retrieved 2011-10-18 (Archived by WebCite). ↑ Kunaicho, "Overseas visits"; retrieved 2011-10-18 (Archived by WebCite). ↑ Kunaicho, "Transmitting traditional cultures to posterity"; retrieved 2011-10-18 (Archived by WebCite). ↑ Kunaicho, "Studies"; retrieved 2011-10-18 (Archived by WebCite). ↑ Chancellor, Alexander. "The Japanese emperor's lesson for the British monarchy," The Guardian (UK). 17 March 2011; retrieved 2011-10-17. This page was last changed on 18 January 2019, at 10:51.